Activists are calling on the Burundi government to free three schoolgirls jailed on Thursday for allegedly defacing President Pierre Nkurunziza's photograph. Yves Ishimwe, a member of the National Federation of Associations Engaged in Children's Welfare (Fenadeb), said: "We call on the government to release the children, and if it is punishment let them be punished according to the school rules and regulations." The students were detained at Ngozi prison in the north while awaiting the findings of an investigation, after being accused of scribbling on the president's picture in their schoolbooks. 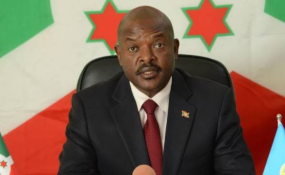 "With so many real crimes being committed in Burundi, it's a tragic that children are the ones being prosecuted for harmless scribbles," he said. In 2016, Burundian intelligence agents arrested eight secondary school students accused of insulting the head of state by drawing and writing phrases like "Get out" or "No to the 3rd term" on a picture of President Nkurunziza on a textbook. HRW says that the same year, hundreds of children were expelled from several schools for scribbling on the president's face in textbooks. "There is a need for the government to co-operate with the commission in order to guarantee freedom of expression, press and campaigns," said Lucy Asuagbo, a member of the commission of inquiry on Burundi.